I’m sure I’m not the first person to have said, food knows no borders. How else could our first exposure to Cafe Affogato be in Poland? The first I’d heard of it was when Ed told me about having one at a golf course with his Polish golf pro friend, Przemek. I had a couple of Cafe Affogatos while we lived in Poland. One of the more memorable was at a driving range. You can read all about that here. While we’re on the subject of difficult to pronounce Polish names, how about Przemek? He was the golf pro at this posh driving range. At first, I thought it was Shemek, but no. You must find a way to mumble Prz in front of that . . .shemek. How did we come to be having Cafe Affogato for breakfast here in Tucson? Well, we’re having them in the morning because we don’t have decaf espresso. We’re having them again because on a recent trip to Costco trying to remember what we were shopping for, we drove by Tuscon’s new Top Golf, a multi-level driving range that serves food and drinks. It’s Chuckie Cheese for grownup golfers. We haven’t been yet, and I said that we should make a point of trying it out because it was as close as we would get to Hotel Solei, home of the driving range mentioned in the paragraph above. That led to planning to buy ice cream and what cute little cups we would use to serve our Cafe Affogatos. 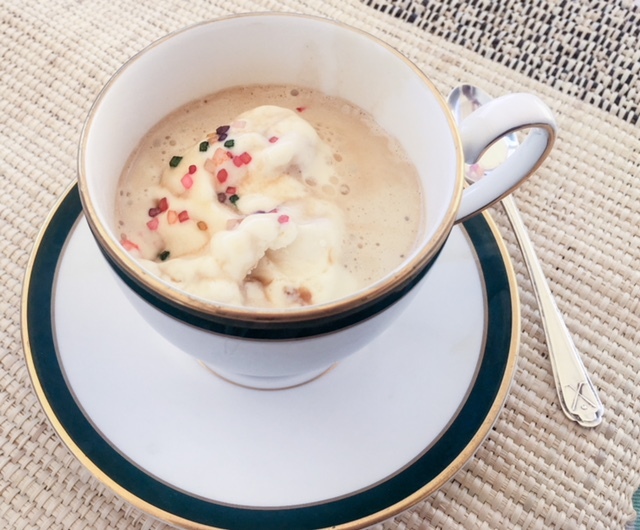 If you haven’t had one yet, let me explain that affogato is Italian for drowned. It’s simply a scoop of vanilla ice cream or gelato drowned with hot espresso. It is a dessert or a beverage? You’ll find it in both places on the menu depending on where you are. It’s so simple that I feel a little silly putting it into a recipe format, but that the only way to let search engines know that I’m writing about how to prepare something. 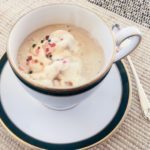 You can, of course, do as others do and fancy it up a bit, with other flavors of ice cream, syrups, sprinkles, or maybe even some yummy baked good under the ice cream, brownie affogato? Go all out with favored ice creams, sprinkles, syrups, make it your own!